Network Rail’s long-awaited plans to improve the sea wall have been approved by Teignbridge District Council. 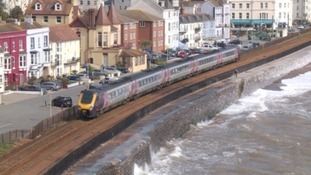 The Government has announced up to £80million in funding to build a new sea wall to protect the Dawlish railway line. Large parts of Dawlish town centre have been evacuated following reports of a gas leak. Lauren Scott, 20, suffered fatal injuries after her hair and clothes got caught in a milling machine which had no protective cover. Network Rail announced a programme to provide short-terms repairs to the railway line on the day of the 2018 Budget. There are almost 400 vacancies for on-call firefighters in Devon and Somerset. Tina Burke says these newly-hatched cygnets are a sign of the milder weather we have had recently. Let us know where and when you took it and it may feature in our weather forecast or on our website. Three men have been jailed following a robbery in Dawlish, where the victim was sprayed in the face with ammonia.